A Midsummer night's dream: Kevin and Whitney — happy. pretty. When dreaming of your wedding day, record-breaking floods and torrential rains are never included in your vision. However, when Whitney married Kevin on June 24th, 2017, this is exactly what happened. The rain began on Thursday. By Friday most of our community was under water. Homes were flooded from basements to rooftops. Bridges were washed away. Roads were closed all over town, making it impossible for anyone to get anywhere. 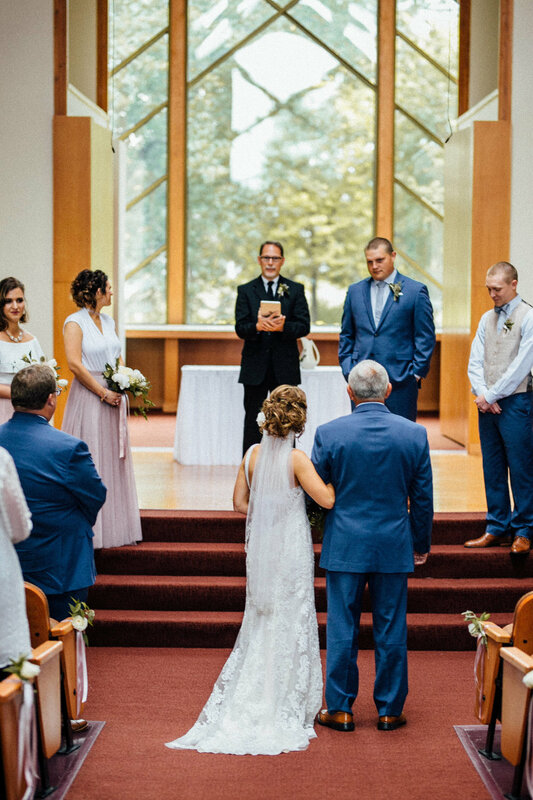 The grounds of their reception venue, The Midland County Club, looked more like a beautiful Northern Michigan lake than a golf coarse and was inching closer to the ballroom with every raindrop. Our shoppe was predicted to be underwater by the weekend. 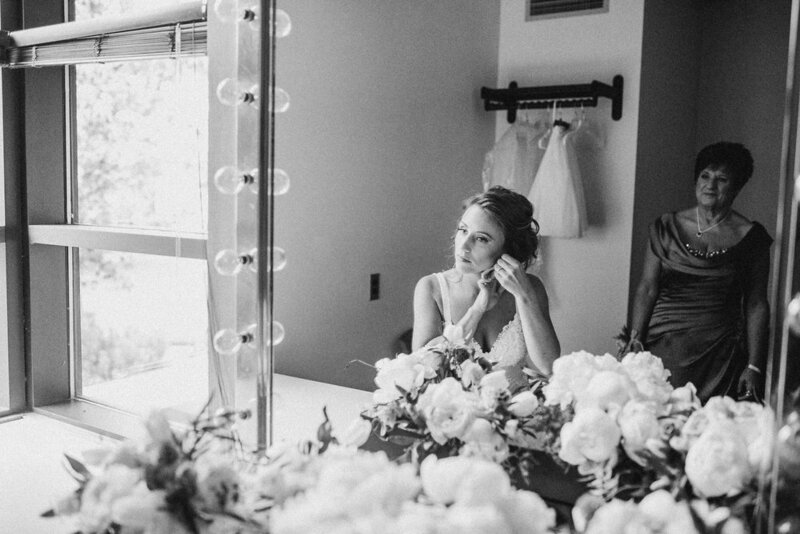 As a professional, it is my sworn duty to never share any behind the scenes chaos with my bride and groom before their big day. Those stories are for another time. Their wedding was no exception. Although, I knew Whitney and Kevin's compassionate hearts were more concerned for the well-being of wedding guests and our community as a whole than their wedding. All that mattered to them was that they were going to be married. Which is what made everyone involved even more determined to make their day magical. Any of my incredible team members, friends, family... and even family members of my team who were able to get through on the roads, pitched in to move all of the flowers and supplies from our shoppe to my house Friday afternoon- less than a minute from the country club and on much higher ground. The living room became our work space. Finished centerpieces were stored in any space we could find; including our bathtub. Aside from a minor basement flood, we were fortunate to be able to concentrate on the task at hand. When Whitney and Kevin's wedding day arrived, the heavy rain had subsided, the country club was still above water and it was time to celebrate this beautiful couple. Whitney had chosen tulle skirts in varying shades of pink for her bridesmaids. I proposed to create garden- inspired bouquets in soft hues of blush and white. 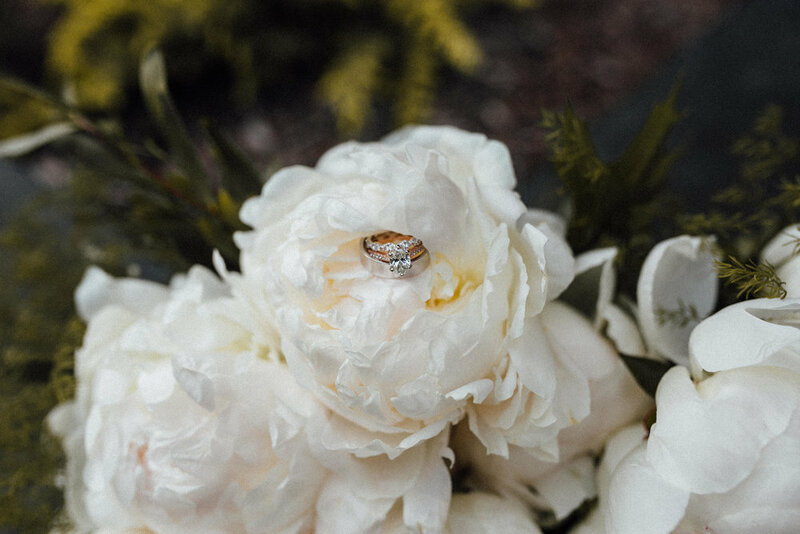 Her one request was peonies for her bouquet. I gave that girl the biggest bouquet of peonies she's ever seen. She deserved every. single. one. For the reception, I had suggested the feeling of walking into an untamed summer garden and she let me run away with it. We created large-scale etherial centerpieces to create a focal point and height in the ballroom. Smaller arrangements of sterling roses and blush peonies in mercury glass compotes surrounded by pears, greens and votives were placed on the remaining tables. We finished the centerpieces with hanging candles nestled in terrariums and glass raindrops. How fitting. .
At the end of the day Kevin and Whitney's dream had been fulfilled. They were married. And that is what matters most. Katherine, Tammy, Holly, Emily, Kindra and Tracie @ Event Elements. I could not ask for more from you ladies but every time you give it. Everyone at Midland Country Club. Midland, Michigan Your staff always goes above and beyond.